ZTE has quietly announced a number of devices these days, including the 8" V81 tablet, affordable Blade C smartphone, the Grand Memo phablet, and now the ZTE Mozilla smartphone. To tell you the truth, the last one isn't really announced, but the folks from ZTE gave us two hashtags to follow for their MWC 2013 event: #ZTEGrandMemo and #ZTEMozilla. 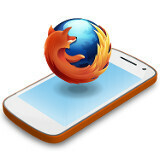 Given the recent news that ZTE wants to launch a Firefox OS device, it is only logical to assume that the Chinese company will do so at MWC 2013, and that the device may be called ZTE Mozilla.